Get out the peanuts and Cracker Jacks and get ready for fun with America's national sport. The unofficial anthem of baseball has never looked better than it does in this joyful board book. A sweet, boardbook introduction to the baseball diamond. Colorful, collage-like illustrations are a kid's ticket into "Sluggers Stadium," where two animal teams step up to the plate and vie for victory--all cheered on by Katie Casey, the baseball-loving cat. And what a game it is! Giraffe winds up at the pitcher's mound, hoping for a strikeout. But, with a thwack, ball meets bat, and Crocodile is off and running. Can Tiger tag him out at first? He'd better, because Elephant's up next and that will cause a commotion. Jack Norworth was an American songwriter, singer, and vaudeville performer. He is credited as being one of a collection of New York-based songwriters and lyricists that made up Tin Pan Alley in the late nineteenth and early twentieth centuries. 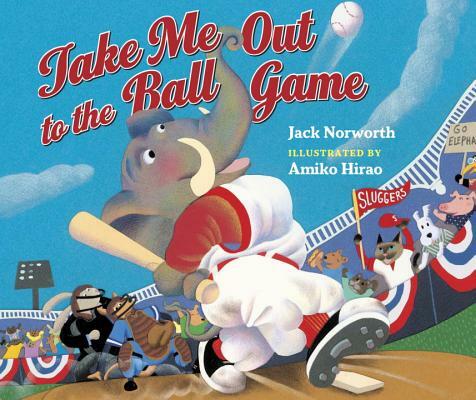 "Take Me Out to the Ballgame," for which Jack wrote the lyrics, was his longest-lasting hit. Amiko Hirao earned a degree in art history in her native Japan, and later graduated from the Rhode Island School of Design. She has illustrated four children's books, including Tulip at the Bat by J. Patrick Lewis, How the Fisherman Tricked the Genie by Christopher Sunami, and All Aboard by Mary Lyn Ray. She lives in Brooklyn, New York. ♦ The song may have been written by a man who had never been to a game, and it was first sung on the vaudeville circuit of early-20th-century America, but it has long since taken its place as the venerable and beloved anthem of baseball. Of course, modern fans do not include the original verse when they sing the refrain during the seventh-inning stretch. The fact that the lyrics are about a young woman's deep love of the game would greatly surprise them. Katie Casey "saw all the games, knew all the players by their first names." The song has been illustrated often, in myriad styles and techniques. Hirao creates a cast of enthusiastic animals to populate the teams and spectators at Sluggers Stadium. While the fans, including Katie the cat, are of mostly domesticated varieties, the players are alligators, giraffes, elephants, hippos and other wildlife. It's a visual tour de force, with double-page spreads of large, action-packed, brilliantly colored scenes in startlingly off-center perspective. A Carly Simon CD accompanies the book, and youngsters will have a wonderful time reading and singing along. In a charming note, Simon provides some surprising information about her connection to both the song and Jackie Robinson. Joyous fun for all. This ode to Norworth's beloved anthem includes the song's little-known verses about "Katie Casey," who is depicted as a baseball-obsessed cat. When Katie's "beau" (a white dog) asks Katie to the movies, she instead suggests a trip to the stadium. There, they root, root, root for the home team, which includes a giraffe, zebra, and elephant. Sometimes awkward phrasing and meter ("When the score was 2-2,/ Katie Casey, she had the clue,/ to cheer on the boys,/ she knew just what to do") may explain why the verses don't have the popularity of the chorus, but fans should still enjoy Hirao's dynamic scenes of ballpark action. An included CD features Carly Simon's performance of the song and two others. It wouldn't be baseball season without a new rendition of "Take Me Out to the Ball Game." This one includes a three song CD by Carly Simon, who has altered a few of the lyrics to modernize the language and added an interesting note about Jackie Robinson living with her family from 1954 to 1955. The main purpose here seems mainly to be to showcase the CD, which was originally recorded for the Ken Burns PBS program. The illustrations are vibrant and pleasing and make full use of each spread as feline Katie Casey, an avid baseball fan, spends every cent she has to go and "root for the hometown crew." There is plenty of ballpark activity crammed into each scene, and the animal characters are amusing, if sometimes busy. Name recognition will raise interest in this book, mainly among adults.